It’s hard NOT to smile when you see that look. Haha, I think I might had a slew of eyes for Chase for each of his moods. Also, that is one classy water gun. … I then died a little from learning that. I doubt the kids who played with it ever though anything of it at least. Hmm…those eyes look good on him too. And somehow, I don’t think he did it on accident, lol. Might be the father is lying to convince his daughter to break up with him? I don’t recall him shooting the gun accidental or otherwise. What I do remember is him almost walking into a spider. Haha, I knew it! Taking all that crap from him…I’D wanna shoot him too! you have to admit that when you give a gun to some people they get a sile like that and the feel to shoot is like a strong drug. you probably explained somewhere already, but what’s the deal with Motokool? Are you letting that go for a while or…? I wanted to take a break, the coloring style takes very long so I’m trying to find a way to make it look as nice while cutting a few hours off on time. I haven’t forgotten about it, but it will be coming back this/next week, te new page is done, just have to write the text in. Egads! I wonder where the boy wonder was for all of this? Now I wonder how many other DC characters shared this marketing fate. I love Chase’s eyes in this comic. The water gun made me giggle. I’m happy you do like the eyes, they will appear just as commonly as the other eyes he uses now, perhaps for the mood he’s in at the time (like deviously giddy). And that fun, that’s not something to be done to a sailor, yeesh. Ahh, Chase, you’re a man after my own heart. Thanks for making my day yet again, Scott! 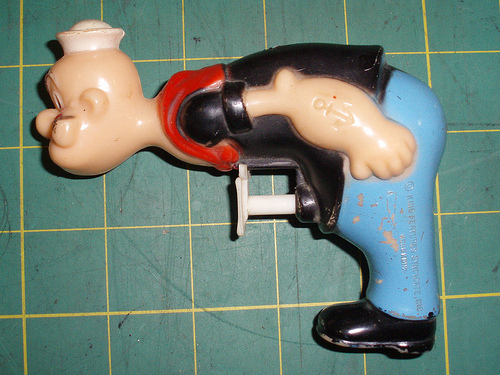 Popeye’s Pen0r Puller Water Pistol is another thing on the long list of items that will now haunt my dreams. Once again, epic win comic. Love your stuff, Scott. ooooooh….”disguised” murderous intent (insert evil grin here)..
Am I the only person who read the last line in Sean Connery’s accent?